1-Ask to have the backing removed. This can be done carefully without any damage done and easily replaced. The dust-cover, or backing paper is easily and inexpensively replaced, if it is torn. This is done with all authentications. Once the dust-cover is removed, look at the back of the canvas. Held up to the light (with the back of the canvas facing you), you should see multiple layers of paint. This is usually more evident with paintings in the style of Gottlieb, where lines and shapes are present. Artists apply oil paint in layers, so what you are looking for is ‘thickness’, or evidence of the vicious medium. *Please note here that they are getting tricky and using various glosses, varnishes and gel combinations to ‘effect’ brush strokes. If you look closely at the back, and front, you will often see that the strokes do not match the subject matter. Ink from a machine is sprayed completely even. 2-Ask to have the frame removed. This can also be done carefully without any damage done and easily replaced. If it is a print, you will see a straight line all around the four edges of the piece. They may have tried to conceal this with painted on fake brush strokes, but with careful examination you will still see the line underneath. When an artist works, there will always be paint on the edge of the canvas from obvious effort. Even with those artists that use tape for a clean edge, there will be some seepage underneath the tape and paint ‘debris, such as, splashes, speckles, ‘feather’ markings. Work from a machine will always have a straight and very clean line. 3-And finally, if you have a good magnifying glass, or a jeweler’s loop, you can examine the front of the piece. What you are looking for here, is evidence of a printing machines pixels…or minute dots. A very good giclee machine will still leave some evidence, but you may need to know what you are looking for. Also, look for ‘breaking’ across the tooth of the canvas. This will be seen on the highlights of the piece, so look for any white. White is generally left alone on a piece and often applied last. With the magnifier, closely look at the tooth, or ‘bumps’, of the canvas to see that the white paint is only sitting on the top of the tooth. 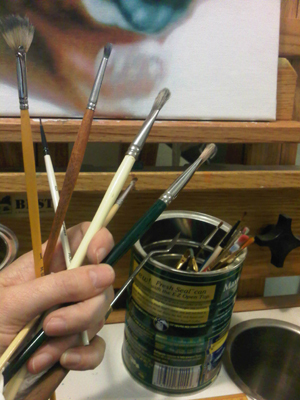 As the brush is pulled over the canvas with the thick final strokes, the top of the tooth is what grabs the paint. If it is a large area, look at the edge of the white, or highlight, color. If all of this leaves you in the same ‘guessing’ spot, then my advice is this…have it authenticated. For either the forger has done such a great job that his effort alone deserves the fee, or…you may have the real deal. Best of luck to you and I will hope you have a real FIND! Thanks for the information. I am going to an auction were there is advertised a “Painting”. If so I would be very interested in it. If it is a print but advetized as a painting I want to know that. Your infomation might prove very helpful. It’s also important to protect your investment!! Having your artwork authenticated by professionals is an incredibly important step if you want to be successful in the art market. If you need any help on this please visit monetexperts.com. Have a great day! So many years I’ve searched for information on a picture, reproduction, print still not sure what it is. Have contacted so many experts all telling me different things. I have a Giacomo Brogi picture which is 3 feet X 3 feet of the La Madonna del Magnificat, original painting by Botticelli. On the back of this cloth there is a label with a number on it and says the name of the picture and the who is the artist was. It also states it was from The Galleria Uffizi Firenze – Giacomo Brogi foto. I found his (Giacomo Brogi)archive book and the number that is on the back of this picture was found in his archive book, which says this picture was in the Galleria Royale Uffizi – Firenze. After so many years I still don’t know what it is. Have any suggestions on how to tell if it is a print? or reproduction? or an actual photograph? Who knows someday my answer will come. Thank you for any information you can send me. Hi Lee. All of those things are printed so you are really trying to ascertain the purpose of the printing. You said it’s a cloth. .. Do you mean canvas? What is the number on the back? Was it framed/matted? Many artists will ship pieces unframed and rolled to a show for best protection of the work. They will then be framed for the show and returned to the artist the same way the artist shipped it. It sounds to me what you have is a catalog number for the show or even a display wall number so the event coordinators know which wall/position to hang. My advice is to find more info on the show if you can. Find out if other pieces were sold by him and that will give an evaluator some place to start to estimate is worth. They are all reproductions – just done with differing methods and then assigned a starting money value based on quantity first, then method/process/substrate and lastly…that particular artist’s earning potential per piece – at that particular moment in time. The latter can vary greatly from year to year. And when doing your research, NEVER look at the asking price of artwork listed for sale. Only take the SOLD prices. Any artist or their agent can ask a crazy dollar amount for a piece, but it’s only worth that amount if someone actually pays it. This is sometimes done for promotion to make the creator appear more valuable. Since what you have is a reproduction, then any markings you find on it are only going to serve as value indicators to a specialist appraiser familiar with his work. My advice is to splurge on the appraisal fee and find out what you are craving to know. If the appraiser is worth the money, then they will also have answers to your questions about it’s history. Good luck! Thank you so much for your time and advise, it is greatly appreciated. Just got gifted a few pieces of nice art. Not originals but they do have signatures and numbers (364/748). I even have one with a limited edition authentication certificate. Are they prints? If so are they still worth money. They have nice frames, glass, dust covers, and some even have gallery stickers on them. Some have a print signatures and an additional artist signature. Any info would be helpful. Thank you. Hi Eric. Yes, anything numbered (364/748) is a print/reproduction. L/E (limited editions) are also prints/reproductions. I’m not going sugar-coat this for you…since the advent of new technologies and the strained budgets for luxury spending, these items have dropped dramatically in value. This is why I got out of the print making biz. It just wasn’t worth my time. We now live a world of digital sharing and EVERYONE can take decent enough pictures with a camera that is with them at all times; go online; order wall-art, matted and framed to any size and do it inexpensively. Signatures, numbers, certificates, stickers and extra documents aren’t going to change the value of the print/reproduction unless that particular artist is World-Famous (past or currently)- AND…has the ‘current’ sales history to warrant any great value. It’s kinda like the real estate market…an artist can put any price they want on a print, but it’s only going to sell for the value of the current market environment. To find out what that current value is…you will most likely need to hire a professional art appraiser. As the art trends ebb and flow, these professionals stay current on the pricing. Many people spend countless hours searching the internet without success. That’s because, what you will find on the internet will only be what someone/company has posted and will not contain a complete catalog with current values that they hope for. A professional appraiser will either – already know it, or know how to get that info. The tricky part…is that the appraisal could cost you $100-200 with a final art value of say…$50. So do your research before you hire one and I would also recommend taking several pieces for a better ‘batch’ price. Good luck! Question….would a.print have spots of paint coming off canvas? It is possible. Many prints on canvas are painted with a few strokes or completely covered with paint and sold as “embellished” for a higher price. Hi Charles. Do a search for the artist (Bartolome Esteban Murillo) and then look for the title of the peice on the sites. If its numbered, then its almost assuridly a print. problem. Where could I take it within the orange or L.A. County area to have it checked? Hi there. Sorry to read about your experience. First thing to do is have it authenticated. Do a google search for “art authenticators in la”. I cant recommend any, so you will need to talk to 3 that peak your interest and then choose one. Dont decide on 1 phone conversation. Meet 3 companies, then decide on one. This wont be cheap, so be smart with the expense. Second, I would talk to an attorney. Providing you have proof (COA) that it is/was an original, no matter what the authenticators report – original, damaged or fraud…you may have a case. Good luck! Are all of Vincent Vangough’s paintings accounted for? I have a picture that has, I think 12,sunflowers and it is signed by him. Are imitators allowed to sign their paintings? Have researched him and the work he has done and it looks real similar. It looks as tho it could have been in water color and the material it was done on reminds me of wallpaper. I would like to sell it but don’t know how much to ask seeing I’m not sure what it’s worth. If you can help me out i’d be very appreciative. There is no way to know exactly what and how many pieces of art an artist does in his/her lifetime, as we often dont exhibit pieces we dont deem worthy. They are shoved in a studio corner or painted over. And many times, they are just studies for a larger work. Society is just recently obsessed with cataloging every waking minute of our lives via our new technology. Back in the day, they painted because there were no photos. They didnt have the same obsession we do now. Yes. Forgers and mimics copy the signature just like the painting strokes. You could have a piece that he deemed unworthy to be seen or an undiscovered study. Or, you could have a fake, a practice painting from an art student or a reproduction. The only way to know is to take it to an appraiser. Are mid century Arno Paris sketches valuable? My dad bought a building in Pennsylvania about 30 years ago. He passed away 4 years ago and while cleaning things out of the building , we came across an album entitled “The mail service of Japan” edited by Tokyo Motion Picture Company. it’s very old and has a bunch of pictures of the headquarters of the ministry of postal services, Kiyoko Yamamoto, Miss Kyoto of 1949 as well as her sister Fujiko Yamamoto who was Miss Nippon of 1950 and much more. My question is would this be of any value? It looks original but I have no idea who to take it too? I can forward you some pictures if necessary to show you and maybe shed some light on what kind of value this album holds if any at all. I have a Harry Anderson Prince of Peace Painting that belonged to my Grandparents, its a signed painting, how do i find out if its an original? All I know is it hung in My Grandparents kitchen all my life…. most great art that’s real is done on cloth , thy put beautiful art ,paintings on things they believe can last in time , I got ones on cloth also, back in time they didn’t have all this stuff we have in the century before us . cloth , wood , was painted on a lot , so don’t believe your art is not real because of lack of canvas. Hi Robin. You would need to find an appraiser. You might try taking it to your local gallery and see if they can give you an idea or reference. You can also try some art pricing sites. Do a search and see if the name pops up. Dont be surprised if it doesn’t though. Someone has to put the info in the database and with SO many artists throughout time…its usually the famous, prolific and current names. Good luck! Hi Marlene. You said “album”. Are they photography? Or is it an album in book form? Im thinking that you might want a book dealer – if the latter is the case. Or someone that specializes in historic documents. Do you have magnified examples of the dotting pattern found on black/white sketches. I have a sketch “1964 ”Don Quixote” – Salvador Dali” I got at an estate sale for cheap. In all likelihood it’s a $150 repro. I zoomed in 8x with my phone/camera and I do not see the dotting anywhere on the pencil lines. I am waiting on my triplet jewelers loop I ordered, but would like to know how to check for signs of prints vs an actual etching. I know even then it’s likely to be a repro, but I found the exact same one sold for $699 (same frame and matte). Hi Brian. Well my first thought is… if you found one with the exact same frame and matting then it is a print that was mass-produced, matted and framed. If you think there is even a small chance that you have a hidden treasure, you will need to hire a professional to appraise. You should be able to find examples of the ‘dots’ on the internet. Found some art at a yard sale 2 rembrant paintings and I would like to know the value of them. Hi Rits, you will need to start doing your homework by searching the internet for information on the prints you have or hire an appraiser. I have found a painting my late Aunt had and it is signed ‘G Inness’, as in George Inness. It was purchased in Harris’s in London, however the only thing on the back is V9 991 N. Do you know what this means? I would appreciate any help, I’m desperately trying to find out whether this is an original or a copy. It does look like an oil painting. Thank you! Hi. You would have to take it to an appraiser to know for sure. Those numbers could be production numbers or maybe numbers representing his catalog of work. Good luck.